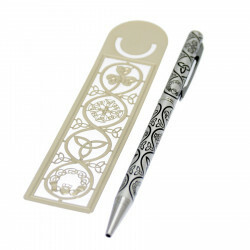 This set contains a bookmark and a pen made of brass (without nickel) with Irish symbols. the clover or "shamrock", the celtic cross, "trinity knot" or trinity knot as well as the "claddagh", famous pattern often worn on engagement ring. This set contains brass, without nickel. Dimensions of the black ballpoint pen: 13 cm. Dimensions of the bookmark: 125 x 30 mm.